Last night, Roberto de Jesus Pivaral y Pivaral was release from police custody due to lack of evidence, and all charges against him were dropped. Pivaral was charged with murder on April 21 (see information below). He was held for 10 days after being arrested by the National Civil Police accompanied by the Public Prosecutor’s Office. Pivaral is a founding member of the Committee in Defense of Life and Peace of San Rafael Las Flores. On April 21 at approximately 7:30pm, Roberto de Jesus Pivaral, founding member and part of the Committee in Defense of Life and Peace of San Rafael Las Flores, Santa Rosa, was detained by members of the Guatemalan Civil Police and the Public Prosecutor’s Office at his home. According to his family, a judge’s order for his capture was not presented before he was taken to the court house in San Rafael Las Flores. The Public Prosecutor’s twitter page states that Mr. Pivaral is accused of the murder of Wosbeli Gómez Sandoval in 2014, a candidate for the Unidad de Nueva Esperanza (UNE) political party. The Committee in Defense of Life and Peace was created as a form of resistance to Tahoe Resources’ silver mine, which began extracting silver in 2014, and has organized good-faith community referenda regarding metal extraction in communities throughout municipality since 2011. Though the Committee had presented the required number of signatures to request such a vote at a municipal level, the Municipal Mayor and his council has denied the request on several occasions. 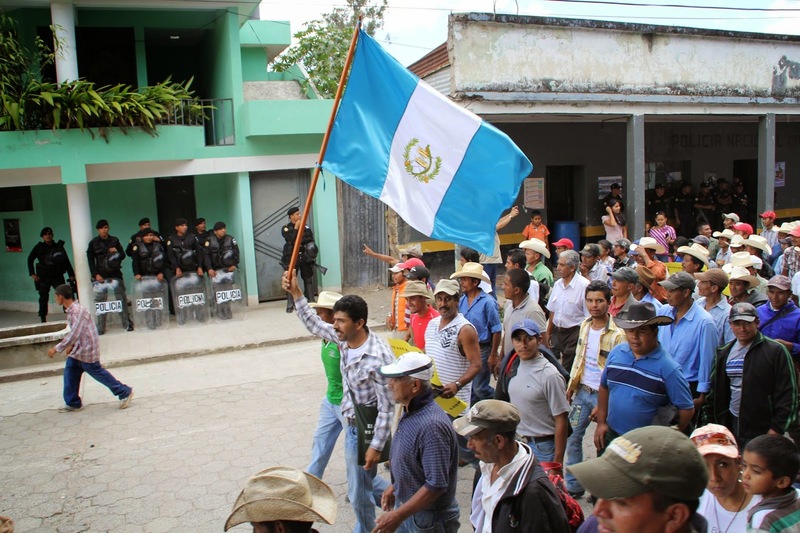 In April 2013, 16 out of 23 local development councils (COCODES) from the municipality of San Rafael Las Flores presented an open letter callingon the President of Guatemala to cancel the exploitation license that had recently be granted to Minera San Rafael. Last year, when Mr. Pivaral made his intention to run for mayor of San Rafael Las Flores known, he vowed to represent the more than half of the communities from the municipality that have publically shown their opposition to the mining project, in addition to those who had repeatedly asked the current administration for the right to hold a community referendum. He has also played a lead role in organizing the consultations that have taken place at a local level. Mr. Pivaral was anticipating running with the Lider political party in September’s elections. Over 90 people have been criminalized in the municipalities around Tahoe’s Escobal mine for their opposition to the project. The Committee in Defense of Life and Peace of San Rafael Las Flores has been especially targeted and the trial against Oscar Morales, another founding member and coordinator of the Committee, began last Thursday. Mr. Morales has been accused of uttering threats against the Manager of External Relations for Minera San Rafael. According to his lawyer from the Centre for Legal, Environmental and Social Action (CALAS), this is the company’s third attempt to criminalize Mr. Morales. Roberto de Jesus Pivaral is currently being held in the El Boqueron detention centre waiting to hear when his first audience before a judge will take place.